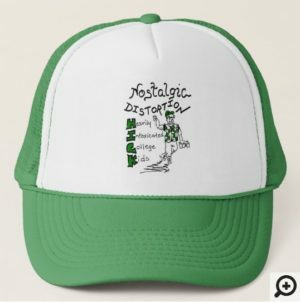 ND “H.I.C.K.” HAT: This hat features the cover art of Nostalgic Distortion’s 1995 debut cassette-EP, “Heavily Intoxicated College Kids”. Originally (before the days of print-on-demand technology), this design was only available on T-Shirts in about 30 stores locally around ND’s home state of New Hampshire – where they sold by the hundreds! But now, thanks to Zazzle, this design is available on-demand on a multitude of products shipped anywhere in the world!!! Purchase as shown (Trucker Hat) or choose from 4 other styles for men and women!